This magnificent hotel showcases refined Italian design and contemporary Art Deco style, with marble floors, Murano crystal chandeliers and colorful mosaics inspired by Roman architecture. Spacious accommodations offer guests the utmost in comfort and style, with a wealth of modern amenities. Many rooms feature breathtaking views over some of Rome's most fashionable streets, Via Veneto and Via Liguria. 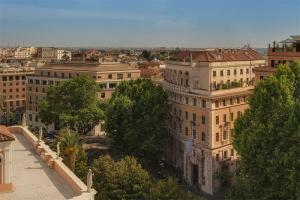 The hotel is ideally located near Rome's many of most famous attractions including the Colosseum and the Spanish Steps.